This is a modern stadium, but it should be as it was only opened in July 1997. The stadium is located 2 miles from the town centre, in some of Derby's industrial wasteland. Excellent venue with no restricted views, good leg room and no smoking in view of pitch, which is very good news if you don't smoke. The main stand is two tiers with executive boxes in between, the roof slopes down to the ends and the opposite side which are a single tier. The corners are filled in to give an enclosed feeling and take the capacity to 33,000, all seated, with up to 4,000 seats for away fans in the Mansfield bitter stand. It is very similar to Middlesboro's Riverside stadium. As with most new stadiums it has been criticised for lack of atmosphere and character, but these can be built over the years by the team and fans. Having been to the old Baseball ground there can be no comparison in facilities, ability to see the game, the pitch and it feels like football has moved into the 20th if not the 21st century. There is a Baseball grill & bar at the ground, but don't think that as an away fan you can eat at these, as the clientele is limited to members only! The ground also has the traditional superstore, where you can buy all the 'Ram' items you could ever think of! Top marks for the ladies toilets, both cleanliness and number of cubicles (...this report was from my wife, I didn't try them myself). Official catering van outside the away supporters entrance. Inside the ground pies, burgers, beer, tea & coffee are readily available. As smoking is not allowed in view of the pitch, the concourse where toilets & food/drink are can get a bit more smoky than usual. Leave the M1 at junction 28 and follow the A38 to Derby. Follow the signs for the A52 (Nottingham) off the Pentagon island in Derby. After 1 mile, look for a large Toys R Us store on the right. Take the next left at signs for Wyvern shopping centre (...the ground is sign posted from here!) and continue to the traffic island. Take the second exit, passing a Sainsbury's superstore on your right, and continue to the next traffic island. Take the first exit over the bridge, into pride park, and the stadium is on the left. Leave the M1 at junction 25. At the roundabout, take the first left signposted Derby (A52). Stay on this road, for 5 miles, following the signs for the city centre. Look out for the signs for the Pride park, and the signs for the travel lodge on your left. Take the next left into Wyvern shopping centre and continue to the traffic island. 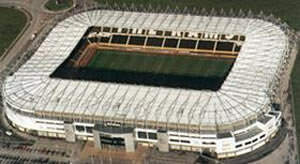 Take the first exit over the bridge, into pride park, and the stadium is on the left. The nearest station is Derby Midland. You can catch the Arriva special buses B1, B2 and B3 straight to the ground. If you decide to walk it, turn right out of the station and turn right at the end of the road into the white wooden passageway leading under the railway and the road. The ground is visible from there, and then walk will take you about 20 minutes. There is no match day parking in the area of the stadium. Away fans are 'encouraged' to park in the 600-space supervised car park at Wilmorton College, on the A6 going into Derby from the south. With the new link road now open away supporters no longer walk along the river path. its just a 10 min walk down the link road, although on a sunny day, this is still an option. When we visited, got out of the stadium fairly quickly after the final whistle, walked steadily back to the car park and got out with no problems. Must be one of the best exits from a football ground ever, but it could be different if it took longer to get out of the stadium. You could try the car-park further along the same road, though it's officially for home fans. There is also a Park & Ride with 200 spaces on Megaloughton Lane. There is some free parking on the road outside the college and in a small industrial estate opposite, and there is also plenty of parking near the railway station which is a 20 min walk. Ikea - Junction 26 M1 (...not recommended as may miss subsequent weekends footie due to building wardrobes!). Alton Towers, Elvaston country park, Donnington Park, Peak district, American Adventure theme park, Matlock, Bakewell. This pub is located on london road next to wilmorton college, and is where all the away fans go on a match day. This pub is located in Osmaston Road (...near the Russell street car park). This pub is usually inhabited by the away fans, but it's small & busy so you'll need to get there early. This pub is located in Railway Terrace (...directly opposite the station). Sorry, but we don't have a review as we didn't go in! This pub is also located in Railway Terrace, and is a large free house pub. This is a traditional pub, with a listed building. This pub is located in Cromarty Close, and is worth a mention as its a Derby County FC Theme Pub. Call 01332 764 385 for further details. If you are a registered user then you can login, and create your own personal review of Derby County Football Club - Pride Park Stadium. These reviews can be private or public.